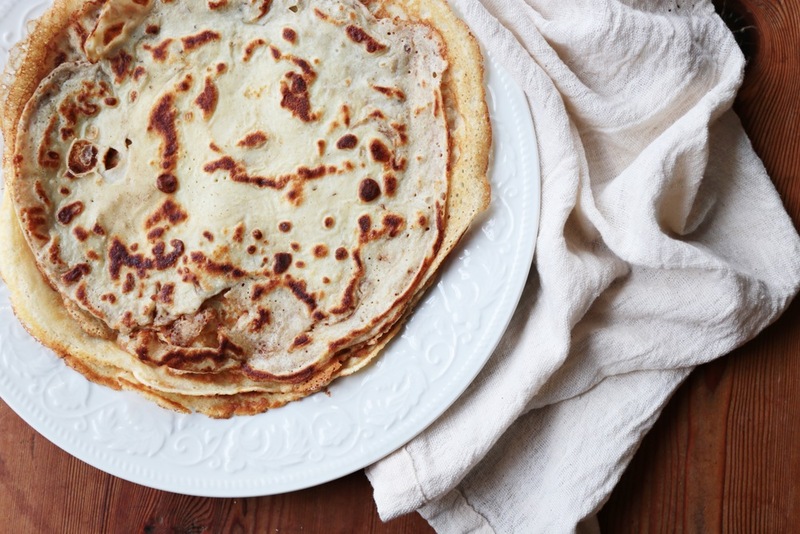 Nothing sets the tone for a cozy weekend like a pile of crêpes in the morning. My insatiable sweet tooth starts with breakfast and crêpes are an absolute favorite. Growing up, my family always made traditional American pancakes. Fluffy and rich, often brimming with blueberries. Delicious, but heavy. The kind of meal that makes you feel more like taking a nap than starting the day! Crêpes are so light and delicate, and are really a blank canvas that you can take in so many different directions. Cheese, onions, and mushrooms for a savory meal. Classic Nutella and bananas. Or another personal favorite: butter, cinnamon, and sugar. Usually I'm the one handling anything sweet and Marcus takes charge with cooking everything savory, but he nailed these breakfast crêpes and I'm happy to let him fire up the oven while I lay in bed a few minutes longer. Okay, wishful thinking with a little girl running around. Layered with Greek yogurt and berry preserves, for a smooth, light taste with just the right amount of sweetness for me. Combine flour, milk, eggs, and baking powder (if using) in blender until smooth. Heat a pan over medium heat, add a little flake of butter to coat the pan. Using a ladle, add just enough batter to cover half of the pan surface, then swirl pan to evenly distribute in the pan. After 3-4 minutes, or when crêpe lifts easily and is slightly browned, flip and cook the other side for an additional 3-4 minutes. Keep warm in the oven. When ready to eat, spread a thin layer of berry preserves over the entire crêpe, as well as a generous dollop of Greek yoghurt down the center. Fold or roll, and enjoy!